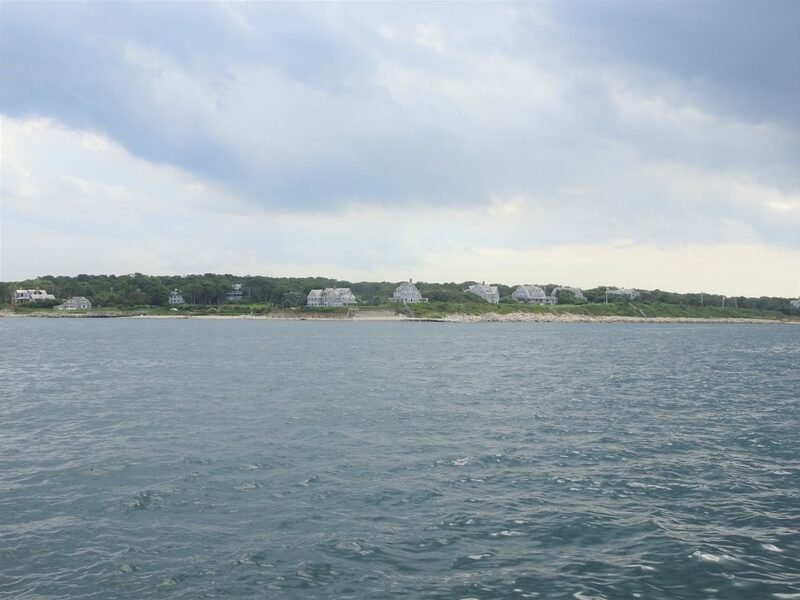 Thursday 30 August: Tisbury, Martha’s Vineyard to Cuttyhunk Island. Bright day again, probably the last one for a while, as the weather forecast shows rain from tonight. Very hot and sticky today, and once the bikes are stowed away, Glen jumps in the water for a cool off and for more hull scrubbing. Which he finishes with, and pleased with the result. There were quite a few colonies of barnacles clustered on the bottom of the keel. A quick supermarket run for fresh fruits and veggies, and back on s/v Cloudy Bay we decide to make a move. Weather forecast shows strong NE wind coming tonight, and we will no longer be sheltered in Vineyard Haven. Up anchor, and we are on our way to the main land. As we leave Martha’s Vineyard, very dark clouds are gathering above us. We motor since we need to run the watermaker. When we are passing through the gap in the Elizabeth Islands, the sky is clear again, so much for the rain that was supposed to come. Not much action is needed on decks when we motor, so Glen keeps himself entertained hunting flies with elastic bands. More than 50 flies down, and there seems to be more of them appearing. Now that we are in the open Atlantic again we feel the swell, and looking at the chart and swell map, we realize we will be quite exposed where we plan to overnight. So change of plans. 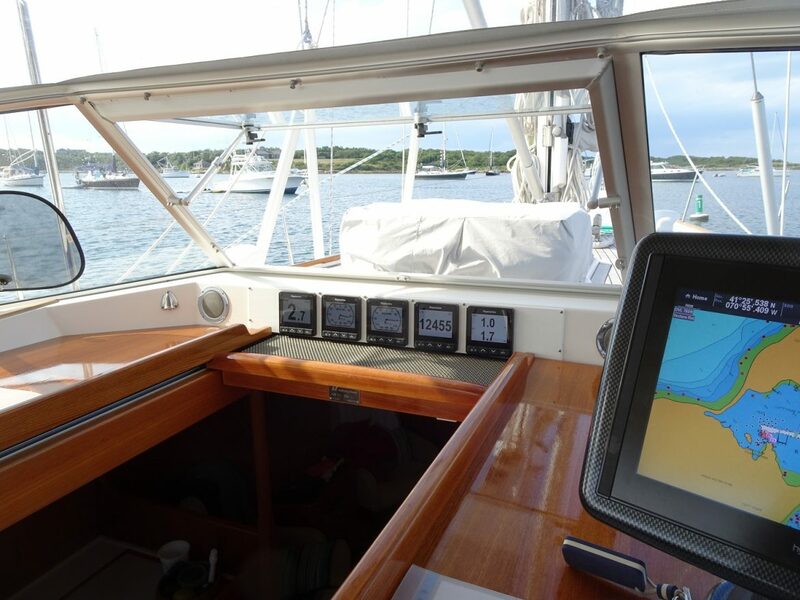 Sharp left, and we point towards Cuttyhunk Harbor at the end of the chain of Elizabeth Islands. There is a very narrow and shallow channel to enter Cuttyhunk Pond, and we are a bit twitchy motoring through it, only 3m depth. Bad coincidence to arrive here at dead low tide. The pond is very busy, they certainly know how to pack mooring buoys here. We doubt our 54ft (plus the dinghy on davits) would fit between any of the mooring buoys. So we decide to anchor on the NE side of the pond, feeling the disapproving looks of people on the neighboring moored boats. Sure enough, we are told off and asked to move even further, as we are obstructing traffic on an imaginary channel (which is not marked in any way). We drop the anchor again, this time squeezing between some small motorboats and hoping the wind will not change, as otherwise we might get into trouble. Dark clouds are gathering again and few drops of rain remind us of our “quickly, close windows and hatches” drill. The cooling breeze makes up for the heat of the last few days, and we are happily relaxing in the cockpit over our afternoon tea. And when it is time to get serious, we start researching where we can go tomorrow. Does’t look like we can anchor in Newport, but we’ll see when we get there. In the evening we attack the Maine videos and make good progress on the editing. At midnight we go to bed, Glen being quite alert due to the strong wind and the tight space we are anchored in. All the anchored boats are kiting all over the place in the strong wind. Hopefully it will all be all right.